At the height of Saddam Hussein’s power, members of the Ba’ath party in Iraq planned a tribute in his honor. They commissioned a golden statue in his likeness, to be propelled into space where it would orbit Earth for all eternity, gazing upon his pan-Arabic lands and its enemies with the eye of God. For the Ba’athists, Saddam was celebrated as a hero whose actions in favor of pan-Arabism marked him as the second coming of the mythical Saladin, who fought the Crusaders in Palestine and delivered them to justice. The rise of Saddam’s personality cult followed with colossal stone effigies erected throughout Iraq. One of these featured Saddam’s stoic gaze crowned with the holy shrine of the Dome of the Rock–conflating his rule with divine mandate and cloaking him under the mantle of the Prophet. Although Saddam’s golden space effigy was never completed, the people of Iraq have a second chance to celebrate their deposed leader. 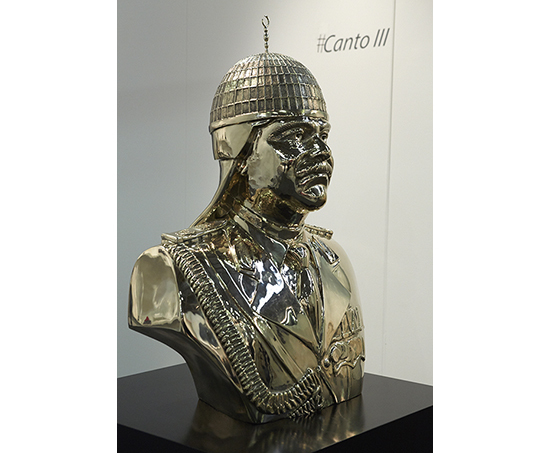 In Canto III, Saddam’s effigy crowned with the Dome of the Rock is reproduced in a 3’ ft bronze cast bust with a golden finish. Although regional politics provides a contextual framework to understanding this project, the public face of Canto III focuses on a light and humorous touch, navigating the border between the real and the sinister. A series of smaller busts measuring 14” inches accompany the golden effigy. 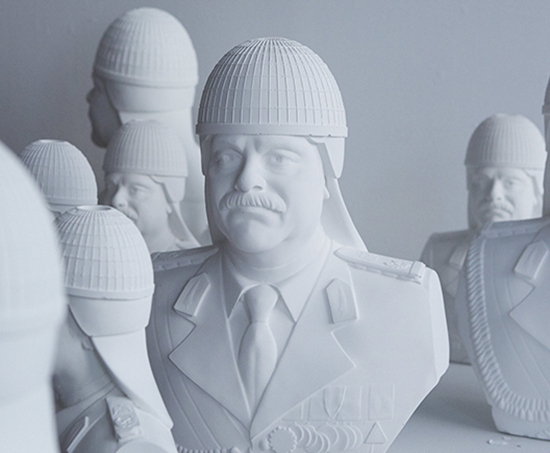 Veterans of the Iraq War fabricated the winterstone busts for minimum wage. 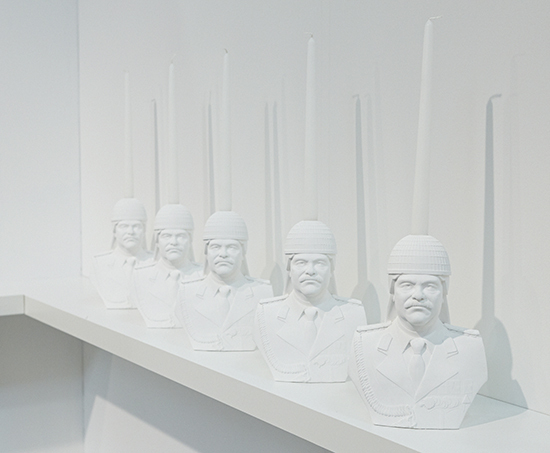 The veterans engraved each piece with their signature, rank, and location of their tour of duty onto the busts. The results of their work are marked much higher than the cost of their labor in order to gently raise issues of art market labor and the struggles that veterans face on assimilating to civilian life on their return home from war. The winterstone miniatures vary in function as well as size, featuring Canto III as a bookend and candlestick holder, arousing a sense of intimacy along with ownership. 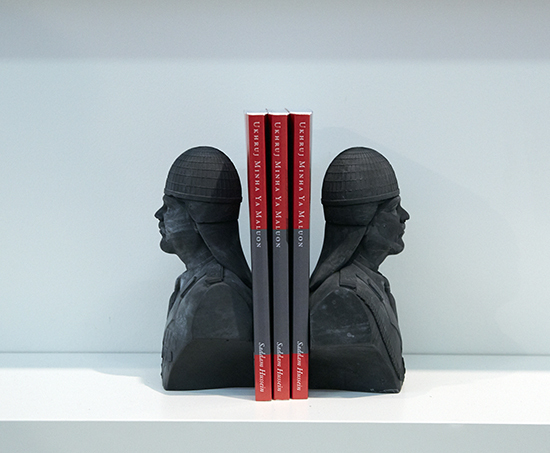 For its rendition at The Armory Show in 2015, Canto III was installed with the large golden bust as the booth’s centerpiece, surrounded by winterstone miniatures on built-in shelves referencing a minimal, high-end luxury goods department store. A photographic render of the statue in upper orbit occupied a wall to the right of the golden bust, while candlestick holders arrayed against the center back wall. The pristine shopping experience hovers between art and commerce, tyranny and gaiety, looking to buy and looking to be bought in.